Cellular Internet of Things (IoT) and machine to machine (M2M) connections will increase nearly fourfold globally from 252 million in 2014 to 908 million in 2019. 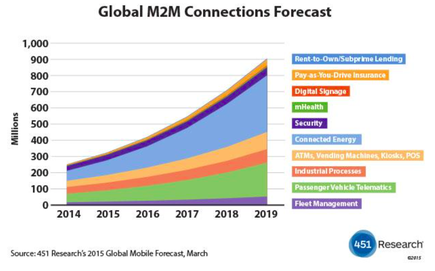 Recent findings from 451 Research, monumental increase in active cellular IoT/M2M connections will be driven by a number of key factors. Lastly, the buzz around this topic is generating overall awareness of the transformational potential of IoT/M2M in terms of ROI, competitiveness and support of completely new business models. The building excitement about what is possible has generated a massive amount of Mergers and Acquisition activity to support position taking for the next decade of IoT-driven business transformation. In addition, the latest 451 Research data report shows that connected passenger vehicles and connected energy will pace the market in terms of connection volume while emerging solutions such as 'pay as you drive' insurance will grow the fastest. “We continue to be bullish that ultimately the hype of IoT will be proven to be warranted back on business impact,” says Brian Partridge, Research Vice President, 451 Research. “Over the forecast period we expect that M2M/IoT solution suppliers will find fertile ground in vertical markets such as retail and government that will adopt IoT/M2M to enable strategic digitisation strategies such as smart cities and the use of digital signage, mobile point of sale, and connected kiosks to drive the transformation from brick and mortar to ʻclick and mortarʼ." Also falling under the theme of IoT, 451 has also released a new long form report titled “Time for Work: Smart Watch App Development Turns to the Enterprise” authored by 451 Enterprise Mobility analysts Ryan Martin and Chris Hazelton. Key findings in the report, backed by recent 451 IT Decision Maker survey results, showed 39 percent of US IT decision-makers at companies that use or plan to use wearable technologies will deploy solutions in the next six months; 24 percent plan to deploy in the next 12 months. In addition, 81 percent of US IT decision-makers who say their company plans to deploy wearables in the next six months will favour smart watches. “The release of Apple Watch has opened the flood gates governing wearables’ adoption,” says Ryan Martin, Analyst, IoT and Wearable Technologies, 451 Research. “But now that the river is running, it’s less about where it will end and more about where - and when - to start. "We expect wearable technology to deliver a key interface and input into the Industrial Internet of Things (IIoT).